Today it´s the third day of Hunterweek and it hit me. I haven´t introduced my hunters to you. Yes hunters. I have three hunters so far. My first hunter is also one of my first characters and she was my first to ding level 90. Her name is Salvira and is the one whose name I use as my name on Twitter and on here. Salvira is the only character that has survived from when I started playing WoW until now and I will never ever delete her. We have done to many things for me to delete her. 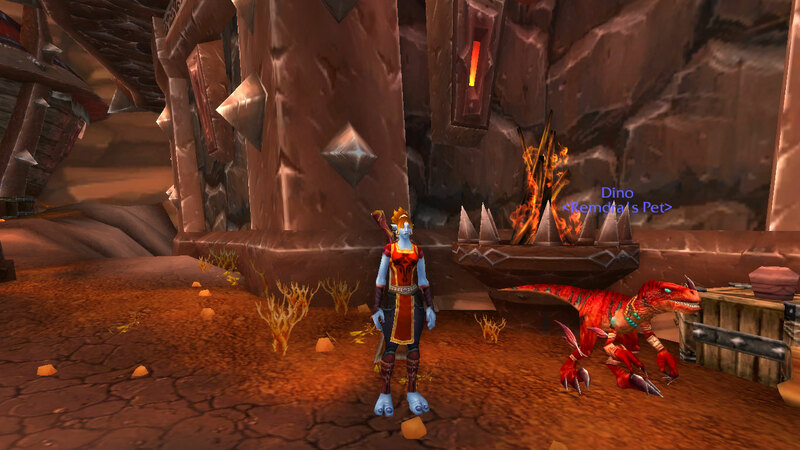 She´s a Troll and that´s the race I like the most for Horde hunters. She´s a Marksman and a Beastmaster. 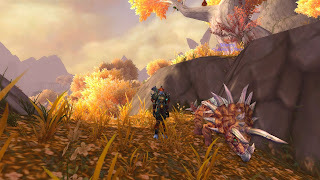 I must confess that I first only choose BM to be able to tame Skoll and Louge. The pet she has that I´m most proud of having is Solix. Think I died about three time before I got it right. He easily oneshots you and can´t be tamed untill he has about 30% health left. Since it´s Hunterweek now and my hunter already was level 90 I thought about starting a new hunter and I did.. It just happens that I started two.. Oooppss.. So say hello to Alberia and Remdra. Alberia is the hunter that I had pictures in my first post for Hunterweek but I´ll put her up her aswell. She´s a Worgen hunter and a tribute to my first Worgen that was a warrior. So this is Alberia with her starting pet that still hasn´t gotten a name change yet. Not sure what it will be so it´s dog for the moment. 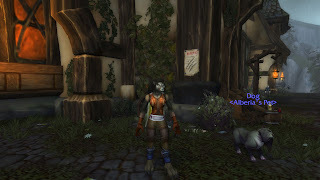 I choose Worgen since that´s one of the Alliance races that I like, mostly since well I like werewolfs. And yeah I LOVE the accent they use. At the moment she´s only level 5, but I´ll play on her later this week to give her some more levels. And there´s Remdra. She´s another Troll hunter. Yeah I really like Trolls. She was made when people on twitter came up with a only hunter guild of twitter people. She´s only level 15 and hasn´t yet run any dungeons. Her raptor has gotten a name change and is called Dino since I didn´t think that long about it. She will become stronger as time goes as I often log onto my low leveled characters some times when I get tired of LFR, dailys and running around like an idiot. I think that tomorrows post will be about the pets that I´ve got on Salvira since she´s the only one of my hunters that´s got more than one pet.